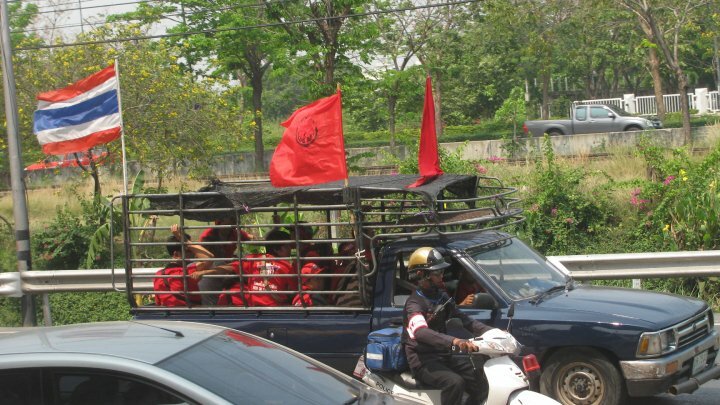 The Red Shirts are a political group in Thailand. They are the people; the working class. They feel that they are being treated unjustly, so they protest. In the past their protested have been met with violence on behalf of the police who do not think twice about shooting protesters. So now, to prevent blood shed, they have organized. They tell the police weeks in advance when they will protest, where, and for what reason. The Yellow Shirts are their opposition. They seem to have more power which is no surprise since they have more money. The Yellow Shirts are more able to get the attention of the powers that be mainly because most of them are the powers that be. In November of 2008 they took over the airport and shut it down. For the most part, protests are tame and no reason to cause alarm. But every once in a while things do get out of control. Because of this potential, Mark and I were given the day off during the Red Shirts protest. We were planning to go to Old Siam, but then decided it would be best to get out of Bangkok. …And Taryn is back. 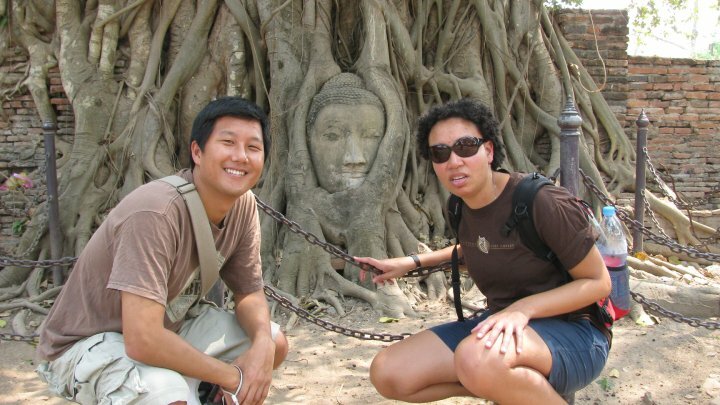 She took a trip to Laos, but now she’s back in Thailand for a little while before she heads to the states. The first thing we did when we got to Ayutthaya was find a place to eat. After lunch we walked out to the street and found a tuk-tuk. 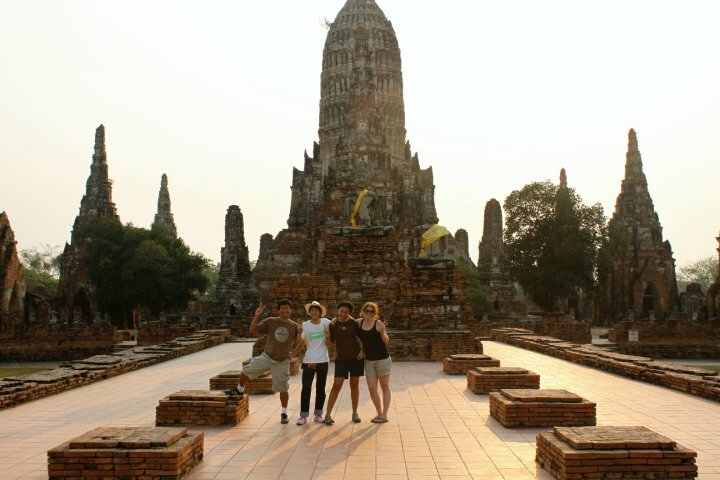 Ayutthaya is not overly touristy, so the tuk-tuk drivers don’t ask for 200THB for a 5 minute ride. Instead they charge 10THB per person. I don’t remember where we asked him to take us, but that doesn’t matter; he didn’t take us there. Because Ayutthaya is not heavily bombarded by non-Thai tourists, the tuk-tuk drivers don’t speak English very well. Most of them carry postcards and maps. They will hand you the post card or map and you point to where you want to go. 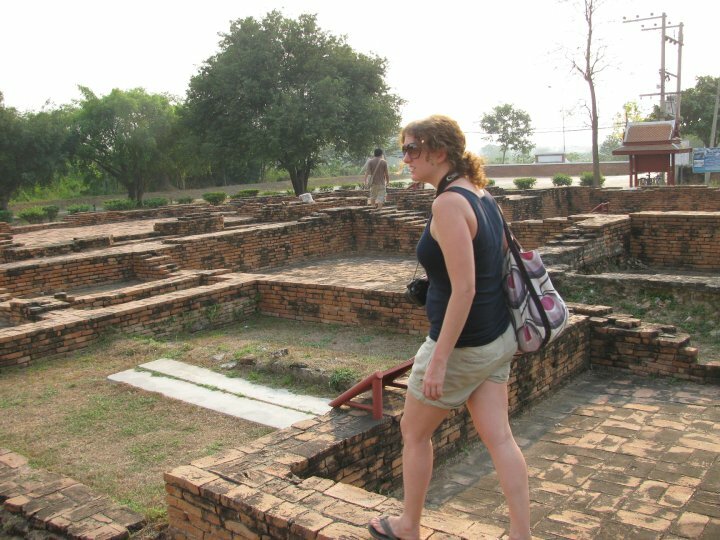 Our first stop was Wat Mahathat. Most of the temples in this town cost 50THB to get in. Walking through this old city, I felt like I was in a movie. I couldn’t stop taking pictures. Everything looked so beautiful. But it was dreadfully hot, so we stopped for some Thai iced coffee at a restaurant across the street. While we sat next to a fan and sipped our drinks we decided on where we would go next. Are there any the tuk-tuks with a/c? We hired a tuk-tuk driver for the rest of the day. It was 600THB for 3 people. For most stops, it’s easy to find another tuk-tuk. But for some stops, there were no tuk-tuks to be found. 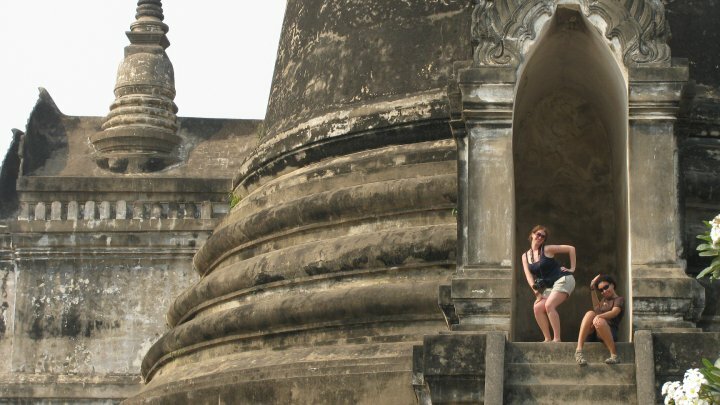 It was really hot and after a while I prefered riding around in the tuk-tuk with the breeze blowing on my back to walking around the astonishing ruins. 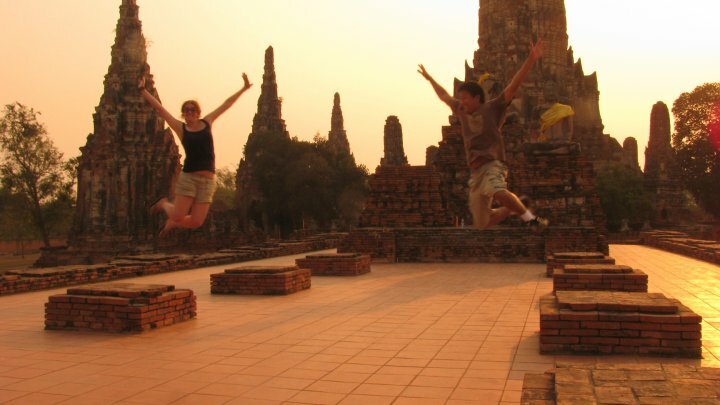 The first place he took us was Wat Phra Si Sanphet (วัดพระศรีสรรเพชญ์). The next stop was a Wat Lokayasutha. This was a very sad stop. Not many tourists come here. There were some little stalls where people were trying to sell things, but there was no one to buy. I can’t help but think that those people need to pack up and move to a more popular Wat. They would make more money. 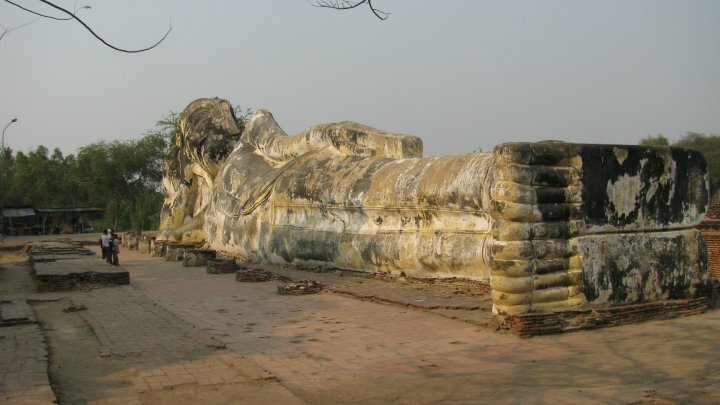 Fun Fact: The Buddha statues in the reclining position, like in the photo above, depicts Buddha on his death bed. These are real human bones. Then we went to St. Joseph’s church in the Portuguese Settlement. That’s where we found the old bones. It was eerie looking at so many dead people; their graves open and exposed. Then some random guy walked into the church. He kept telling us to look outside. We were still looking around inside. We wanted to know who these people were and why they died. We walked around the inside reading signs on the wall and hanging from the ceiling. But the strange man, who spoke very little English wanted us to look at something outside, in the front. What’s so interesting out here? We went back in to have a closer look at the bones in the glass case. The guy came up to the display and pulled open the drawer. Inside were more bones. He picked one up and handed it to us. I wanted to hold it, but was a bit creeped out. Tayrn took one and posed for a picture. The guy wouldn’t go away. He told us that there are more bones, Japanese bones, outside in the back. We went back there and he led us to the water. He pointed to a temple across the river. We were willing to walk around the backyard of this church, but we didn’t want to go anywhere with him. He started to mumble some unintelligible things; more stuff about bones. 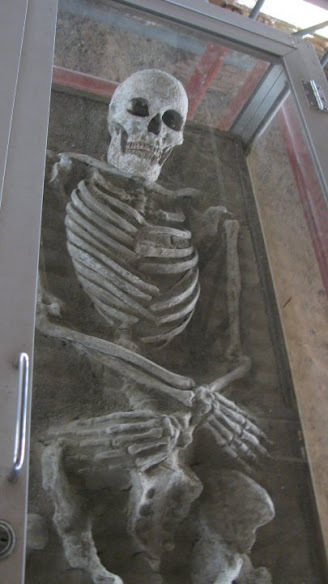 But seeing more than 50 skeletons when you are used to seeing none has a way of sicken a person, even for just a bit. We didn’t want to see any more. It was time to go and try to forget about death. We thanked him for trying to tell us about whatever he was trying to tell us about. We really only understood about 20% of what he said. This annoying guy followed us around. We didn’t understand much of what he said. We didn’t ask him for anything. Then he demanded that we pay him. We walked away, got into our tuk-tuk, and left him there. This seemed to amuse the tuk-tuk driver. The highlight of the trip was a visit to Wat Chai Wattanaram (วัดไชยวัฒนาราม). We almost didn’t go. When we got back into the tuk-tuk we were going to ask to be taken to the bus station, but everyone forgot. So the tuk-tuk driver just took us to a nice temple on the way back to the bus stop. As we passed it we all gasped. 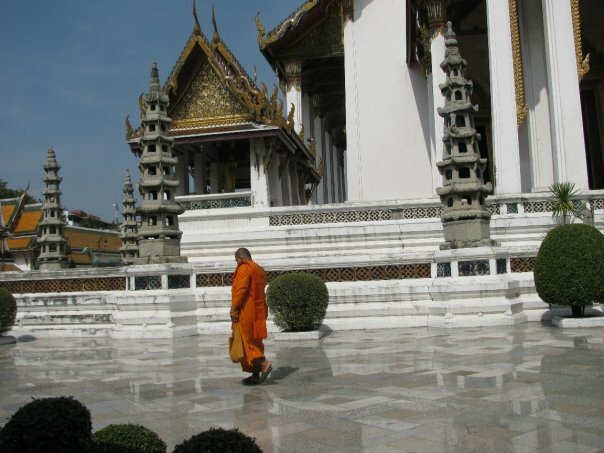 If you really want to make the friends you left back at home super jealous, go to this temple. Take tons of pictures. Stay for sunset. They will all hate you when they see your photos. 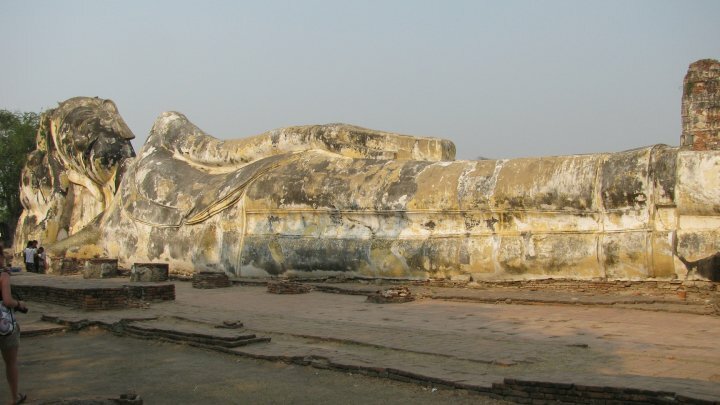 There are two main ways to get to Ayutthaya, by bus or by train. Go to Hua Lamphong Train Station (หัวลำโพง). A ticket to Ayutthaya should cost about 15THB. For me, since I live in northern Bangkok, it was easier to go to Mochit Bus Terminal (หมอชิตสอง). The ticket cost 50THB and the ride took 1.5 hours. 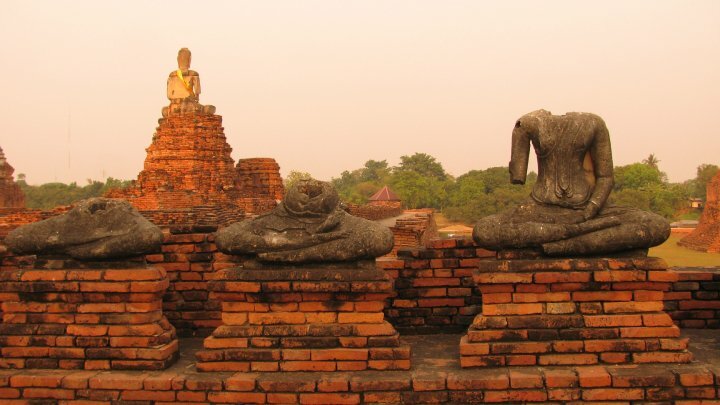 How ever you try to pronounce the name, “Ayutthaya” no one will have a clue as to what you are trying to say. The main historical city is on an island. You can walk around or save time by getting atuk-tuk. Get a price you are comfortable with and destinations worked out before you get in the tuk-tuk. Many tuk-tuk drivers will have laminated maps with trip plans in English. It’s not too far from the bus stop. It’s between Naresuan Ally and Ho Rattanachai and along a canal. 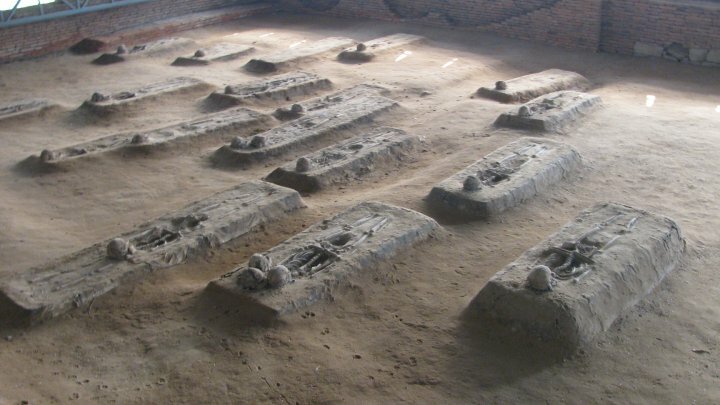 No one knows when this temple was built. 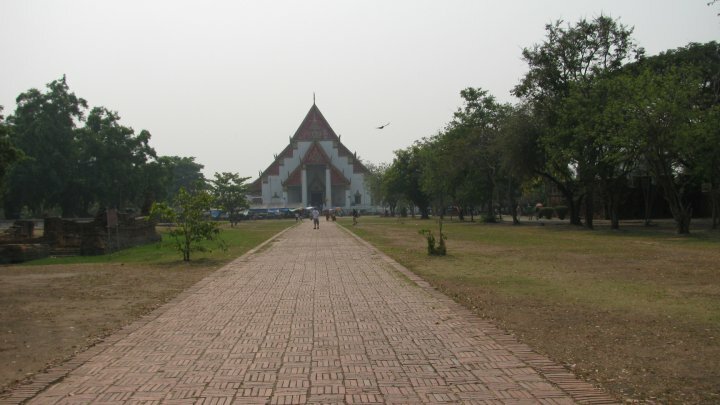 This temple is in the north-east corner of Rama Public Park along Naresuan Ally west of Wat Lang Ka. 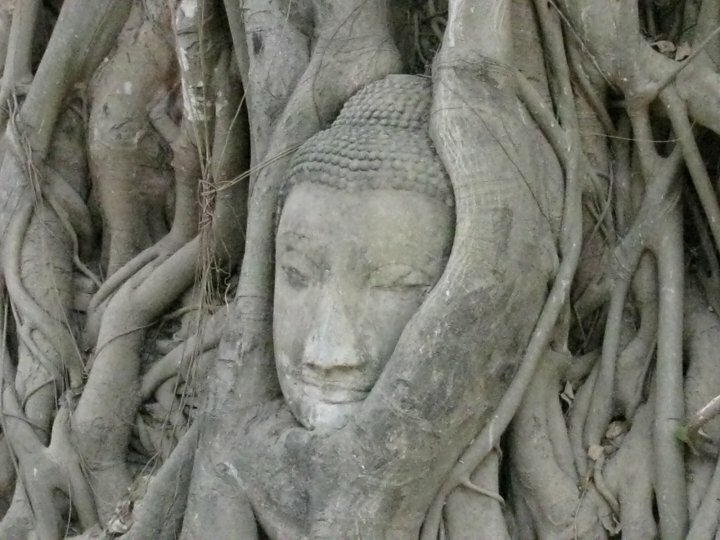 Wat Mahathat is park of the Ayutthaya Historical Park. This temple is west of Rama Park. 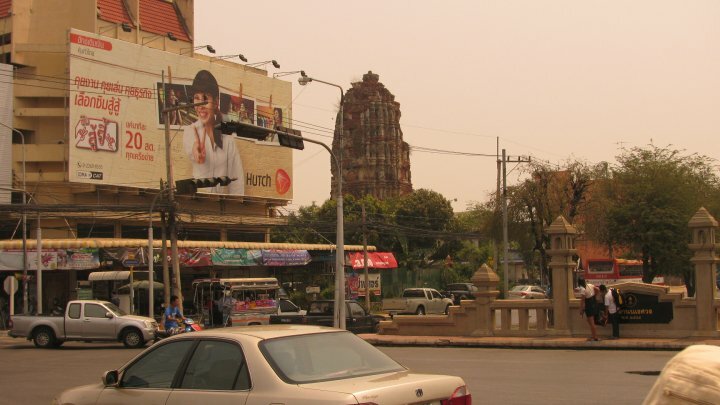 It’s west of Phra Mongkhon Bophit, right across the street. But you might have to go around the block. It is not on the island. It’s south of the island and across the river from the Japanese settlement. It seems to always be open, but I’m not completely sure. I think you can open the draws and look at the artifacts. At least there is no one there to tell you not to do that. This temple is not on the island. It is west of the island across the river from Queen Sirikit Palace. Do not skip this. You must see it! Just head towards the old airport or go up north. Below are some buses you can take. As you drive by look out of the left window. For some parts it runs parallel to Vibhavadi Rangsit Road. 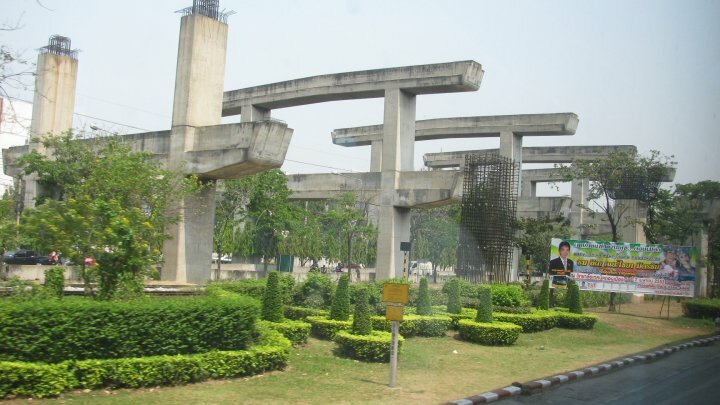 This is what is left behind from a now defunct project to link the Don Muang Airport (old airport) to downtown Bangkok. For many reasons it was never finished and will never be finished. Some have called it the Stonehenge of Thailand. 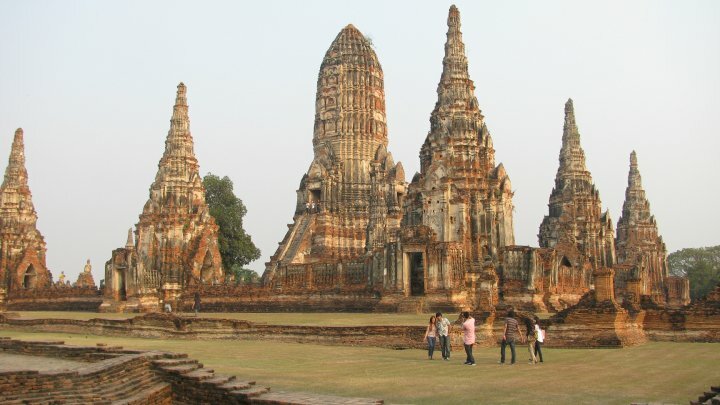 It is not in Ayutthaya, but you will see if you travel between Ayutthaya and Bangkok by bus.